At any given moment there are approximately a zillion different crowdfunding campaigns happening on the Web. Take a stroll through Kickstarter or Indiegogo and you’ll find no shortage of weird, useless, and downright stupid projects out there – alongside some real gems. We’ve cut through the Pebble clones and janky iPhone cases to round up the most unusual, ambitious, and exciting projects out there this week. Keep in mind that any crowdfunded project — even the best intentioned — can fail, so do your homework before cutting a check for the gadget of your dreams. Consumer UAVs are currently split into two separate camps. There’s the cheap, palm-sized “nanodrones” that can’t do much, and then there’s the bigger, fuller-featured camera drone set that costs you an arm and a leg. Unfortunately, there isn’t much middle ground at this point, but Onagofly aims to change that. Bridging the gap between those two categories, Onagofly boasts all the requisite drone tech you’d expect from a full-sized drone (camera, GPS, auto-stabilization, etc), but it’s all packed inside a tiny, plam-sized package. 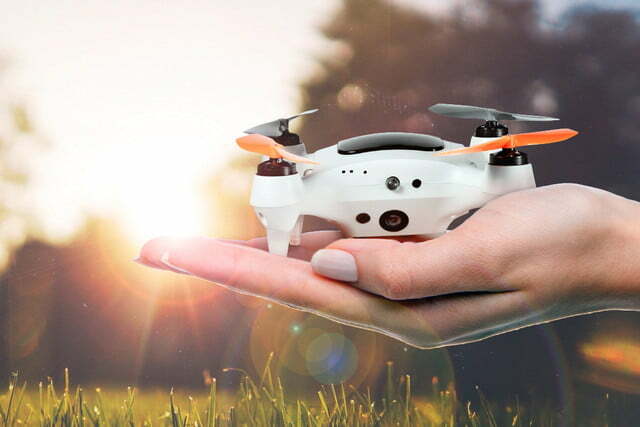 It almost sounds too good to be true (and it could very well be that way), but despite the Onagofly’s small size, it has specs and features typically found in much bigger drones. For starters, it can be controlled in real time from an iOS or Android smartphone via Wi-Fi, up to a distance of 20 meters (66 ft). It can also lock onto the GPS signal of its user’s smartphone, following along above them at a predetermined height while they run, ski, cycle, or whatever. It even shoots digitally stabilized video in 1080p. GoPro might have the corner of the market when it comes to small, rugged action cameras, but that doesn’t mean it’s the only horse in the race. There are hundreds of newcomers aiming to steal a piece of the action-cam pie — and Mokacam is one of the best ones we’ve seen to date. 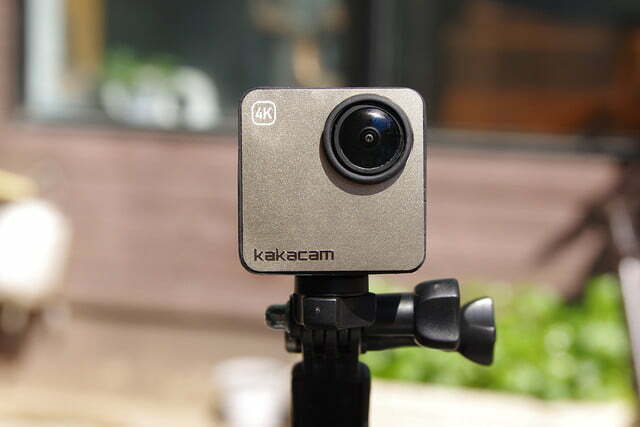 It’s still in the crowdfunding stage at this point, but if its creators can successfully see it through to mass production, Mokacam could very well give GoPro a run for its money. It’s crazy how much stuff they managed to stuff inside this little gizmo. Despite the small footprint, it’s got a full-on 4K camera inside with a 152-degree wide-angle lens on the business end. There’s also an integrated microphone for recording audio, and a magnet for attaching the camera to metal surfaces. For those who need a little more, there’s also a snap-on magnetic LCD screen that can be attached for viewing footage as it records. This same snap-on system also allows users to snap on an extra battery for extended shooting. This is one of those inventions that makes you shake your head and wonder why nobody thought of it before. 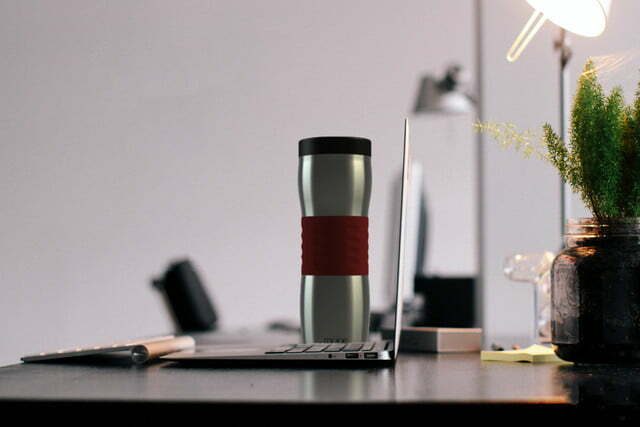 Finally, someone has invented a mobile coffee brewer that doubles as a travel mug — so you can brew fresh coffee and have it deposited directly into an insulated, travel-ready mug. It appears to work fairly simply: Just add some coffee (your own or their packets) and water to the thermos, make sure the battery is adequately charged, and press a button to start brewing. The Mojoe uses what its creator’s call a “VacDrip” brewing process, which combines elements of vacuum brewing and drip brewing. After you fill it up with grounds, add some water, and hit the start button; the element heats the water up to over 200 degrees. The steam created during this process then pushes the water up through the siphon and over the grounds, filling the coffee chamber with hot, freshly brewed joe. The process reportedly takes about 10 minutes from start to finish. Losing your wallet is one of the worst things that can ruin a good day, but thankfully there’s a number of innovative startups that have developed solutions to this horrible first-world problem. Take the Ekster wallet, for example. 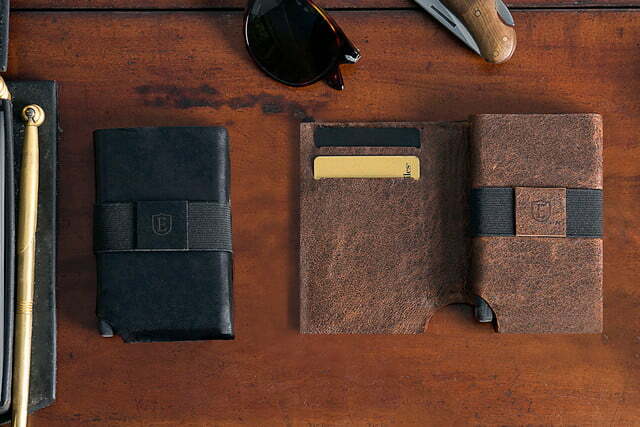 On the outside, it looks like your average compact wallet. It’s slim, its’ sleek, and it’s made out of high-quality leather — but it’s more than just that. Underneath the stylish exterior, it has a bunch of helpful tech built into it. For starters, it has a Bluetooth transceiver, so it can connect to your smartphone and send you alerts whenever your wallet goes out of range. This feature is designed to prevent you from leaving your wallet behind — but that’s just the first line of defense. If your wallet is legitimately stolen or missing, you can use the accompanying app to track down the wallet’s location via GPS. When you get close, you can even make it beep so that it’s easier to pinpoint. Here’s a weird one for ya. 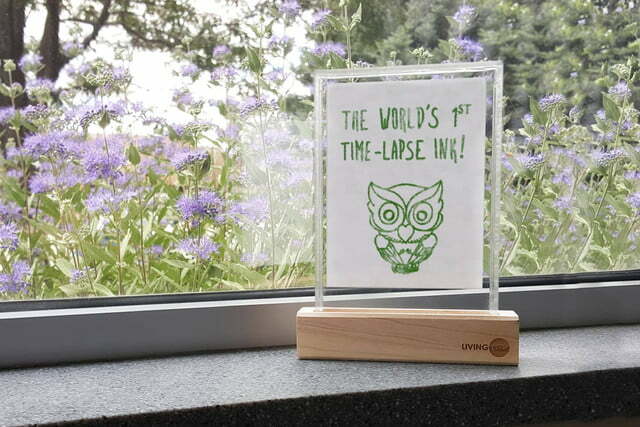 The story goes that Living Ink — described by its creators as the world’s first “time lapse” ink — was actually discovered by accident. It’s creators (a group of researchers from Colorado) were attempting to create an ec0-friendly alternative to petroleum based inks, and one of their first attempts turned out to be a weird ink that starts out completely invisible, then turns green after a day or two. The key to the magic is really just simple science. Living Ink is composed of a potent brew of water, eukaryotic microalgae, cyanobacteria (aka blue-green algae) and chlorophyll — the stuff that makes your grass (and most other plants) green. At first, the lines you can draw with it look like they’re just water, but after you give the bacteria and algae some time to grow, the lines will slowly take on a brilliant shade of green — or blue, or pink. The Living Ink team has actually designed a slew of different inks that reappear at different rates. The pink-hued Fast Ink starts to grow after one to two days, while the blue-colored Slow Ink begins showing after three to four.